As many of you know from following my Facebook page or Facebook members forums, I went to this year’s Grassroots Festival near Ithaca, New York, USA. 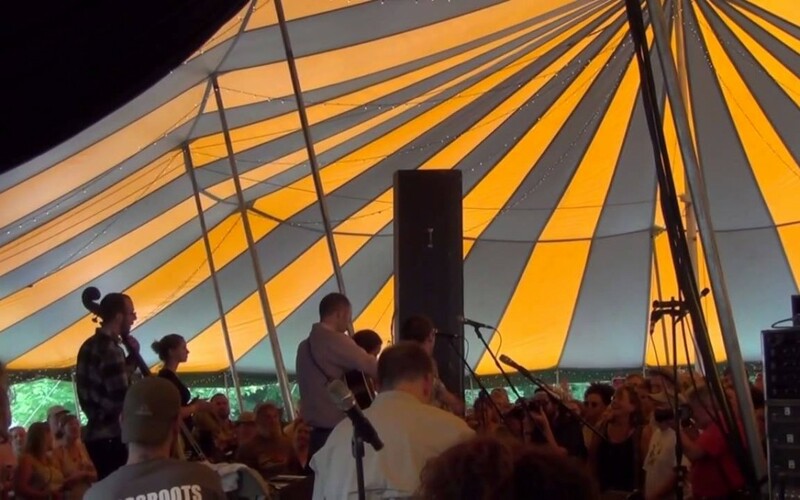 The festival brings together an eclectic mix of musical styles, including some incredible fiddlers and a hot folk/bluegrass band with a rock and roll heart. It also draws an eclectic mix of people, as you’ll see in the video below. And that’s what this post is about. The people. One of the greatest things about doing what I do is that I get to meet some awesome folks. Red Desert students are found all over the world, and I consider many of them my friends. For about five years now, I have been interacting with one of these students, Andy, exclusively online. He’s a musician and teacher and plays many instruments, and contacted me a while back to get some fiddle pointers. Now after nearly five years, we met in person for the very first time at the Grassroots Festival. It was like visiting an old friend! It was wonderful to connect with Andy and his group of warm, welcoming friends. I was welcomed into their camp as if I were a long-time member. This group of friends (including Andy’s two brothers) has been coming to Grassroots for over 20 years. Each year, at Grassroots time, these life-long friends from the little town of Binghamton, NY reunite from all across the country to celebrate friendship and music. Their roots run deep. A lifetime of friendship has resulted in a whole web of traditions. Each year they secure the same camp spot. It is a feverish run from the time the gates open for the “land grab”, and this year they got their same turf. Each year Andy makes Sunday gravy with meatballs on Friday, and on Saturday they prepare the famous “trash can turkey”, which is something to behold. I caught it all on film for you! This clan has named themselves the “Jerkhamptons”, they refer to each other as “jerks”, and I was made an honorary jerk this year. (thanks, guys!) The Jerkhamptons have taken on the organization of a small town, population 40, complete with a mayor. Yes, they literally have a mayor! They are all fabulous musicians from all stripes, and the music they make right in their own campsite makes one never want to leave to see the festival concerts. These talented folks jammed on a wide range of songs and I joined in on the few I knew. Andy and I also played some of the Irish and Old Time fiddle tunes we’d been learning throughout the year. What a rush to find myself in the middle of all this talent and tradition. I was struck by the oddity of it all and the wonder–that Andy and I have been playing over the wire hundreds of miles apart and music brought us together. While I am no longer surprised by the ability of music to build bridges, I am still amazed. Alright, that’s enough. Let me just show you some of the footage and photos. This video features the music of John Specker, Driftwood, and Simon Pugnani, a 13 year old Jerk, singing his original tune with the support of other Jerks in the battle of the bands contest. Enjoy! What a great time you must have had Lora! !Super music. How nice to feel right at home with your online pals. And that Turkey!! Did you get to eat some? That would be waaay cool to try at Thanksgiving. Thanx for sharing your experience!! How could I not taste that turkey! It was even better than it looked!